As our unemployment rate3 inches into record territory more persons are using food stamps. The EBT card1 provides, on average $133 dollars per month in groceries—insufficient for even the most fastidious eater and frugal shopper. The unemployment is lamentable2—usage of food stamps is commendable. Additional funding is required to collect additional current household survey data in pursuit of future food insecurity and hunger research. What a delightfully relevant, pragmatic and scientifically based proposed framework for ensuring the functional adequacy of SNAP! More "American exceptionalism"? Our food insecurity for 2011 was 14.9 percent or 17.9 million households. Wonder what is exceptional about a nation with 14.9 percent food insecurity? GettingFoodStamps, How to Apply Fortunately, those committed to ending hunger in America are working very hard to make it simple and painless to both apply for and use food stamps. USDA, Supplemental Nutrition Assistance Program (SNAP). Another of the seemingly routine examples of a federal southern policymaker engaging in activity adverse to the economically disadvantaged constituents he supposedly "represents"—SNAP resources to economically disadvantaged Tennesseans (and other economically disadvantaged Americans) must be increased, not reduced. Also, we can expect hunger in American (and other nations) to continue increasing in response to a period of significant regional (and global) civil society and economic structural changes. Shifting responsibility for basic or fundamental governmental services to our resource challenged states will not adequately respond to the nutritional (and other) requirements of our citizens during this period. It's difficult to imagine a more fundamentally non-delegable function and responsibility of any 21st century government than ensuring all its citizenry has simultaneous and continuous access to basic nutrition, education, shelter and healthcare. Utilizing concepts appropriate or applicable for an 18th century government are unlikely to be useful, helpful or successful for a 21st century government. These boutique programs are necessary (and very useful) but insufficient to ensure hunger is eradicated across our nation. Programs like SNAP must continue, improve and expand until sufficient to ensure hunger is eradicated across our nation. It's unclear why some of our leadership think that punitive measures will solve our nation's structural hunger problem? According to these leaders our government need only withhold or reduce resources to solve our structural hunger problem! Unsurprisingly, such punitive and perverse logic is ineffective and only exacerbates our nation's ongoing structural hunger problem. Stated differently and somewhat charitably, punishment rarely, if ever solves non-structural problems; punishment never solves structural problems, prayer notwithstanding. Kudos to the USDA for efforts aimed at boosting fruit and vegetable consumption by SNAP users. These type of pilot programs to provide nutritiously dense foods for our food insecure must be extended through all levels of public and private food programs (e.g. food stamps, food banks, pantries, community and recreation centers and other similar food distribution points). Inexplicably, many of our current economic models do not incorporate parameters for estimating and managing equality and inequality—complicating the tasks of understanding and managing our increasingly complex economy. UPDATED 09/26/2012 Reuters, Ferrari seized in U.S. food stamp fraud case Great now our policymakers can increase SNAP resources, instead of cutting it by five percent. Our meager and mostly mean spirited anti-poverty policies are making our poor poorer! Those decrying even our meager and mostly mean spirited efforts at reducing (we're not even close to elimination or eradication) our poverty may want to visit the poor of Owsley County, Kentucky (the images depict another type of "American exceptional")! It's difficult to understand why we elect and reelect policymakers (e.g Senator Mitch McConnell, R-Ky) that allocate trillions of dollars to fight foolish, stupid and unnecessary wars (in which no small proportion of Kentuckians fight and die) instead of allocating those resources to solve the multifaceted problems required to eradicate our poverty. Instead of applauding our USDA for its outreach effort to ensure all Alabama residents are food secure Alabama Senator Jeff Sessions (R-Al) is leading a campaign to implicitly and explicitly criticize those he supposedly represents for utilizing our SNAP program. Session's criticism and condemnation of our poor must be ignored—efforts to ensure all food insecure Alabamians are enrolling in SNAP must continue. Wherever the blame lay for our current budgetary difficulties it most surely is not on the backs of our poor Alabamians. SNAP expenditures can be expected to increase into the foreseeable future—the senators from Alabama may want to focus their effort on (re)building Alabama instead of condemning and criticizing its poor. SNAP will help stabilize Alabama's economy while they focus their efforts on (re)building Alabama. Our census bureau has estimated Alabama's 2010 population at 4,779,736 of which 805,095 participated in our SNAP program at an estimated cost of $1,226,018,708. Not only must Congress not reduce SNAP funding (S. 3240 proposes to reduce funding by ≅$4.5B) it must stand ready to provide additional funding. The seemingly obligatory annual article on food stamp fraud that usually accompany attempts by some of our politicians to limit resources flowing to our poor or economically disadvantaged. Refreshingly this article reports the amount of fraud at a relative miniscule one percent—many articles on food stamp fraud (and other fraud) usually leave it to the reader's imagination, which is rarely accurate. Surely our national security data mining algorithm developers can further reduce the one percent by automatically comparing monthly revenues, sales and EBT revenues by outlet. Alternatively6, those interested in further reducing the one percent can routinely sell (typically for 60-80 cents on the dollar) a statistically representative number of EBT cards across American communities and then trace the transactions to "light up" those networks that reclaim the 20-40 percent profit. These anti-fraud efforts may cost more than the amount recovered or undesirably restrict the number of participating small community EBT food outlets. Unfortunately, current economic policy and market failures6 impede or prevent our larger automated food outlets from profitably operating in our communities where EBT cards may be over represented. And of course, EBT card users' mobility is relatively more restricted due to impaired health or limited income or both. However, some of our politicians' unstated objective may not be a reduction of food stamp fraud but to broadly justify annual efforts to reduce food stamp resources. Of course it makes no sense to increase the food insecurity of millions of Americans in pursuit of the one percent of fraud but this never seems to deter the annual efforts to eliminate or significantly reduce food stamp resources. UPDATED 04/19/2012 SFGate, Howard Buffett helps start rural feeding program. UPDATED 10/07/2010 Reuters, Poverty rises in suburbs, help lags: Brookings. UPDATED 08/12/2010 UPI, Michigan food banks say demand up. Unfortunately, the Michigan food bank is not an isolated case. Instead of increasing food stamps and related resources Congress recently diverted $12 billion dollars of food stamp funding to pay for the recently enacted teacher jobs and medical care (CBS News, Food Stamps Slashed to Pay for Teacher Jobs Bill) legislation. UPDATED 05/24/2010 UPI, Pregnancy food insecurity, weight gain. 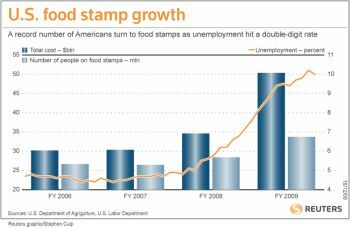 UPDATED 05/07/2010 Reuters, Food-stamp tally nears 40 million, sets record. UPDATED 03/19/2010 California Watch, Hunger in the Golden State. The University Southern California Annenberg School for Journalism & Communication is teaming up with California Watch to conduct a six month investigation and three series program on hunger in California. UPDATED 02/02/2010 Reuters, Biting recession leaves ever more Americans hungry. UPDATED 12/31/2009 Reuters, Midnight in the food-stamp economy. UPDATED 12/08/2009 Reuters, Hunger, family homelessness on rise in U.S. cities. UPDATED 12/06/2009 UPI, Food stamp lawsuit in Maryland court. If your state legislature or local food stamp office has set up a series of meaningless or inconvenient hoops through which you must jump work to eliminate those hoops. UPDATED 11/20/2009 PBS NewsHour, More Americans Facing Hunger, Report Finds. Our policymaker's response to problems may lag based on the dubious rationale that responding may exacerbate rather than ameliorate the problem (i.e self-fulfilling prophecy). When responding to hunger and food insecurity problems our policymakers must lead in their response, not lag. Use any surplus inventories at our nation's network of food banks as a leading indicator of decreasing hunger or food insecurity5. UPDATED 11/17/2009 Reuters, One in seven Americans short of food. Hopefully, our current leadership will not wait for this grim 14.6 percent to become 15 percent before implementing depression era type modern-jobs3 programs nationwide. If you must fret about your food insecurity do so after you apply for and receive food stamps. We can argue about the whys over the next decade. 1. The Electronic Benefits Transfer (EBT) card functions exactly like a debit card. It's used exactly like a debit card when purchasing most food items—non-food items and some "prepared food" must be paid for separately. 2. As more data becomes available it appears likely that much or all of the unemployment magnitude is the result of gross mismanagement of our economy and was partially or completely avoidable. 3. UPDATED 09/05/2009 See NYT, In Unemployment Report, Signs of a Jobless Recovery. Wonder why economists can "look around" and not see any next generation jobs (they can't even see McJobs!) to sustain economic growth? Wonder who was (or wasn't) working on creating and transitioning America to the next generation jobs? Wonder if they were just too busy creating and fighting wars? Wonder if war is our next generation jobs!? Wonder when laissez faire economics will be creating the next generation jobs? Wonder if cooperation and not laissez faire economics is required for next generation jobs? 5. Distinctions between hunger and food insecurity need not cloud our policymaker's immediate and sustained response. The distinction is useful for establishing measurement precision. A person's subjective hunger may not accurately reflect objective food insecurity, particularly if their food intake has been excessive over a lengthy period of time (e.g. see Obese people can misjudge body size). 6. The article suggests yet another alternative albeit somewhat more creative. If, as the article suggests "big" outlets (supermarket) engage in fewer fraudulent EBT transactions, then placing a supermarket in communities where EBT cards are over represented may reduce fraud. Perhaps, with some luck, the amount of the fraud reduction will more than offset any incentive a franchise may require to locate a supermarket in communities where EBT cards are over represented? To the extent that small outlets are selling more alcohol than food or alcohol as food or just processing EBT cards for the 20-40 percent profit they are not directly competing with any supermarket. It didn't take the "brilliant" executives at Insys long to figure out that selling their Fentanyl product to a relatively small market of cancer patients experiencing extraordinary pain was not going to generate extraordinary profits...betcha you can't guess what's next? Those using Fentanyl "at their own risk" can can die from asphyxiation if this powerful narcotic paralyze their chest muscles. Of course, the "gut-the-government" neo-anarchists would not know this, because they'd have eliminated CDC's Morbidity and Mortality Weekly Report as a drag on profits.